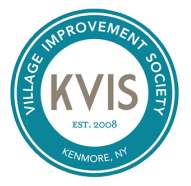 The KVIS Public Properties Committee for many years invited various recycling organizations to come to Kenmore to collect residents unwanted items. This initiative was successful, but as the Block Club Committee discussed recycling on each of their blocks, it became clear that a time to collect many items at one time could continue to impact how much of our unwanted items go to the landfill. To encourage people from all over the area, including Southern Ontario, to come to Kenmore and spend the day. The Garage Sale Map, listing over 100 sale addresses, also includes valuable coupons and offers from area businesses to draw people to visit them as well. To help each person participating in the sale have more people going to the sale while having increased sales volume. To give those who had a sale the ability to drop off their unwanted items in one convenient location following the sale. These items are collected by a not-for-profit recycler. We are partnering with Goodwill of WNY this year to help in collecting unwanted items left over from the garage sales. The truck will be on the Delaware Rd. side of the Village Green (the area in front of the Municipal Building) from 2:30-5:00 pm on Saturday June 24th. Garage Sale participants and others are encouraged to take advantage of this opportunity to conveniently donate unwanted items at this time. In the past, the Gigantic Garage Sale items filled the largest size truck freight trailer full of items donated by those Village residents who had participated in the sale. The 2015 Gigantic Kenmore Garage Sale donations were collected by Buffalo ReUse. For your convenience, the Garage Sale Map and List above is available as a pdf and a jpg. The Treasure Hunt clues are included on the list. Printed copies of the map will be available on sale day and from 9 am to 3 pm at the KVIS tent set up on the lawn of the Kenmore Municipal Building (the Village Green) 2919 Delaware Ave at the point of Delaware Avenue and Delaware Road.